The U.S. economy added 242,000 nonfarm payrolls in February, according to the Bureau of Labor Statistics. The figure exceeded analyst expectations, giving a ray of hope that the labor market bounced back after a disappointing January. The private sector added 230,000 jobs. That ray of hope faded under a dark cloud once it became apparent that the industries hiring the most workers are those that pay the least. As in previous months, restaurants and bars led the way. This industry added over 40,000 workers, the most of any of the 84 major industries. These establishments pay the second lowest average hourly wage, above only gas stations. The Dent Research Employment Index digs beneath the BLS’ headline numbers to measure the quality of jobs added each month. It provides a more complete picture of the job market by tracking where jobs are being created along the wage scale. For a more detailed explanation of our methodology, please click here to view our employment white paper. 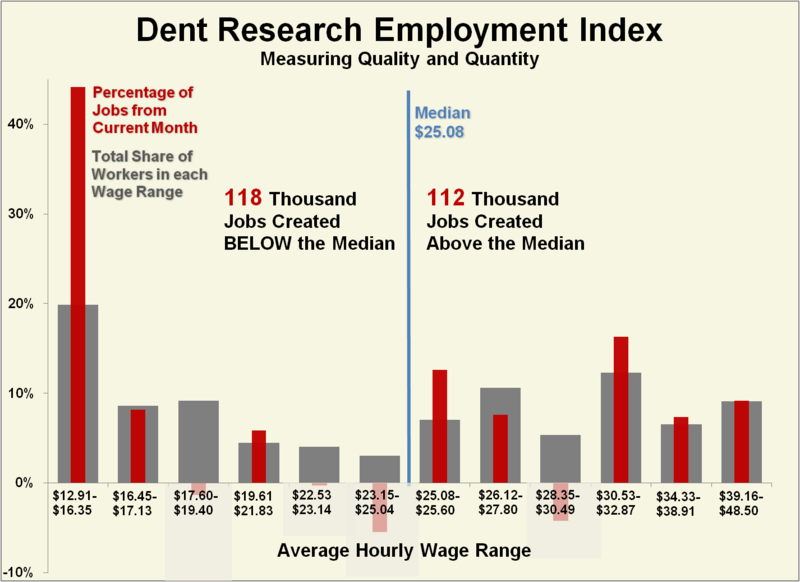 Dent Research is an economic forecasting and investment research firm and publisher that works diligently to provide you with the proprietary economic knowledge you need to accurately forecast what lies ahead in our economy so you can take the necessary and appropriate action to ensure prosperity in your business, investment and financial affairs. The core of our work is what we call the Dent Method, which our founder and economic expert, Harry S. Dent Jr., developed in the late 1980s. It has the only documented record of success at forecasting long-term economic trends based on the study of and changes in demographic trends and their impact on our economy and the markets. It works by showing how predictable consumer-spending patterns, when combined with demographic trends, allow us to forecast the economy years or even decades in advance. For more than two decades, readers and experts have trusted our independent economic think tank and research team to provide specialized and proprietary economic and investment research, analysis tools, and forecast information. With Dent Research, investors and businessmen alike can learn how to recognize and potentially profit from economic and demographic cycles. They can also use our research to pinpoint the best growth industries, the best places to live, the hottest investment sectors, and the key technologies that will change everyday lives. Using his industry-beating algorithm, Adam O'Dell tracks the movements of nine key economic sectors as they rotate in and out of favor. He then leverages that information to predict short-term stock movements with a startling degree of accuracy.